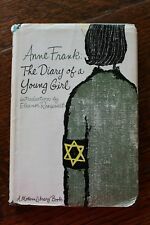 "Anne Frank: The Diary of a Young Girl" 1952 hardcover book with dust jacket. 285 pages. a tender inner hinge a couple of pages in (see photo). a dirt smudge on the edge of the text block (see photo). Rare softcover book, in good condition. ELIE WIESEL. 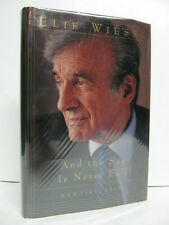 INSCRIBED to Kenneth Hofmann by ELIE WIESEL at the front free endpaper. And The Sea Is Never Full. Boards are square with no leans nor bowing. Edges are crisp with no dings. Corners are sharp. Dust Jacket. First edition. World War II military history. It was the decisive victories of the German Panzer divisions in North Africa in World War II that taught the Allies the importance of an integrated combat team consisting of tanks, infantry, and artillery. WAFFEN SS The Asphalt Soldiers - John Keegan (1970 Ballantine)Very Good. SOLDIERS OF DESTRUCTION by Charles W. Sydnor. The SS Death's Head Division, 1933-1945. 1990 Princeton University Press. Condition :Very Good in aVery Good dust jacket. modest shelf wear to edges & corners of DJ & boards. Herded behind and electrified fence, they were encamped over a Chinese graveyard. On December 7, 1941, the population of Wake Island heard that Pearl Harbor had been attacked. Burton, a native of Utah, had signed a nine-month contract to work on Wake Island. Hardcover book complete in its original pictorial dust jacket. In very good condition. Moderate shelf wear/bumping to the extremities. The unclipped dust jacket is chipped/torn/soiled but presents well under a new removable mylar sleeve. Hallinan represented Harry Bridges in the Union trials. Atty. Vincent Hallinan. JOHNNY HUN. Edgar Johnson. INSCRIBED & SIGNED! INSCRIBED & SIGNED on the ffep hard cover book, very good condition, minor shelf/reading wear, only detraction is that the pages are lightly browned, due to age. First Edition copy, in like new condition. 205 pages. Holsters from Austria, Belgium, Bulgaria, Canada, Czechoslovakia, Denmark, Finland, France, Germany, Great Britain ,Hungary, Iran, Italy, Japan, Lithuania, Netherlands, Norway, Poland, Portugal, Spain, Sweden, U.S.S.R., United States and Yugoslavia. Paul Brickhill and Conrad Norton. Illustrated by Ley Kenyon. Published by Faber and Faber Limited, London. A unique copy of a classic WW2 work. The first iteration of Brickhill's work on the prisoner of war camp breakout later known as The Great Escape, made into a movie with Steve McQueen. Excellent preowned book. One owner. See photos for details. Please see photo for condition. All pages are intact. Map: Good condition, 31" x 17", folded. There are a legend and a brief chronology and an essay by Colonel A. J. Regnier under the image. In color, good condition with a few tears along the folds. Easton Press 900 DAYS Harrison Salisbury LEATHER Military History 1ST EDITION! By Harrison Salisbury. Overall, this copy is a grade collector's book. Bound in Premium Full Leather. Premium Leather. Long-lasting, High Quality Acid-neutral Paper. A very scarce title in any condition, this copy is in Fine and Unread condition. 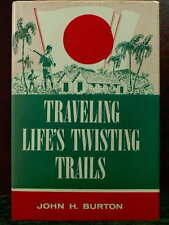 First edition.Hardcover book complete in its original pictorial dust jacket. _gsrx_vers_841 (GS 7.0.16 (841)). THE JUNGLE IS NEUTRAL, Jungle Survival, WWII, Malaysia, China, written by F Spencer Chapman. Published by The Reprint Society, London, first edition thus. Chapman help to train many guerillas, being Chinese, Malay, or even the bandits. The Destruction of Dresden: The Most Appalling Air Attack of WWII by notorious WWII revisionist David Irving. This is a first and original printing for the Ballantine Books edition, and it is in phenomenal condition for its age. The book is pretty much unread and has some light wear around the edges but the pages and front and back cover are in beautiful condition. It is a small vintage paper back, but the binding is very tight and slams shut as if brand new. This book details in length the atrocities committed by the Allies against Europeans during WWII and is one of the very first of its kind. From 1945, the first edition of History of World War 2, by Frances Trevelyan Miller, with a board of Historical and Military Authorities. Published by Universal Book and Bible House, Philadelphia. With 967 pages. The Commandos. Prelude to War. Island Fighting. War in the Desert. The Rising Sun. Battle of Britain. Battle of the Atlantic. Japan at War. By Bob Dole. One Soldier's Story SIGNED. This edition is strictly limited to 12,500,000 copies in (Berlin). 12.5 (London), of which every copy is number 1. Dwight David Eisenhower, (October 14, 1890 – March 28, 1969) was a five-star general in the United States Army and the 34th President of the United States, from 1953 until 1961, and the last to be born in the 19th century. Black cloth-covered boards, gilt titles to spine, blue/black/red dust jacket, 384 pages, illustrations from contemporary photographs. The Tram Stop of the title was the nearest point to Moscow from which a tram could be taken into the city, and was a position held by the German Army. McDaniel, E. F.Aviation Rescue Vessel Manual. Miami: Submarine Chaser Training Center, 1943. First Edition. 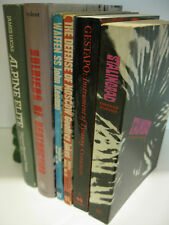 Softcover: Good, 8.5" x 5.5", 191pp. If you have any questions or would like to see more pictures please feel free to message me before purchasing. I am happy to assist you. Thanks for looking and feel free to check out my other listings. (Th Naval Construction Battalion,…). Obviously largely of his World War 2 experiences. Minor wear, minor blemishes and minor marks, a bit bore wear to cover edges. A slight storage scent to is, not bad. The cover of book 1 however, is detached (as seen in picture) and could easily be repaired but I don't want to risk damaging it, so I'm leaving it as is. Book 2's spine is intact. Available For Sale Is 1970 Hardcover The World Aircraft In Colour Book Kikuo Hasimoto. In November 1942, Krebs was also indicted as a Gestapo agent. He was arrested in December 1942 and found innocent in May 1943. This event marked the end of Krebs/Valtin's career as a "Soviet expert". Nice selection of full page ads for naval weapon system manufacturers. Priority available. Port Security Command, Third Naval District, United States Coast Guard. August 1945. (2) THE STORY OF FLIGHT. 4) WEATHER FOR FLIERS. 5) THE MAKING OF AIRPLANES. 6) AIR POWER AND GLOBAL GEOGRAPHY. 7) PLANES OF THE FUTURE.